Tyner Consulting Services (TCS) was founded by Bob Tyner, and specializes in providing hands on line locator training services. Bob has over 30 years experience in the Oil and Gas industry, with an additional 15+ years in developing and instructing programs related to the petroleum industry. Bob also specializes in DOT (PHMSA) Regulated Pipelines, Control Room Management (CRM), Job Performance Evaluations and Fatigue Management. Bob Tyner holds dozens of certificates for classes, workshops and programs completed on safety, training and regulations for the Pipeline business. In addition, Bob is a continuous learner and is focused on keeping current with the newest technology, industry information and regulations. Stan Dubois owns ITC and is our technical expert on line locator products. 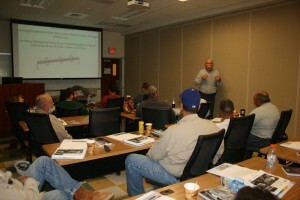 Stan assists with hands on training and understanding of various types of locators. Owned by Andy Bradfield, Andy has over 20 years experience in the Oil, Gas and Pipeline industry. CSI offers management systems, written programs and online training courses geared towards the Oil and Gas Industry. In addition, CSI provides pipeline services such as GIS mapping, audits, and management services. Andy and his company provide assistance with developing our programs and ensuring they meet the latest regulations. California law, CCR, Title 8, 1541, requires annual training and testing. Make sure you and your team are prepared – give us a call today to schedule your class.